Your first thought should be ‘repair’. All of those little (and not so little) niggles now need addressing. Anything you’ve been putting off, ignoring, or simply maintaining, now needs to be fixed, and fixed properly. Physiotherapy is a good first port of call. Get yourself an MOT and set up a plan and schedule to get your body back on track as soon as possible, so that you can concentrate on hitting next season in top form. Book in plenty of sports massage and any other therapies that work for you. No big undertakings! So you thought you’d be bored and you’ve planned a winter marathon to ‘stay in tune’? Forget it. This is all about resting up and resetting your body, then combining medium to long duration, low intensity training, with short bursts of high intensity work. Use the time to build your aerobic fitness levels, but don’t forget the odd foray into the red. Listen to your body; be honest with yourself. You’re tired. Full competition training will resume, but not right now. Don’t worry about gaining a few pounds. Eat more calories and flood your body with plenty of good quality nutrition, but give yourself a break. Training with that extra few per cent bodyweight will provide cushioning and improve your power to weight ratio. You want that big cheat meal at the weekend? Or maybe that bowl of ice cream in the week? Have it! Now is the time to focus on your weak points. Let’s be honest, for most people that’s their swimming. Spend time in the pool and hone your technique; seek professional coaching and personal training to ensure you get the utmost benefit from these sessions. Triathlon is less about what you’re proficient in, and more about where you’re not lagging. You know where the weaknesses lie; eradicate them. 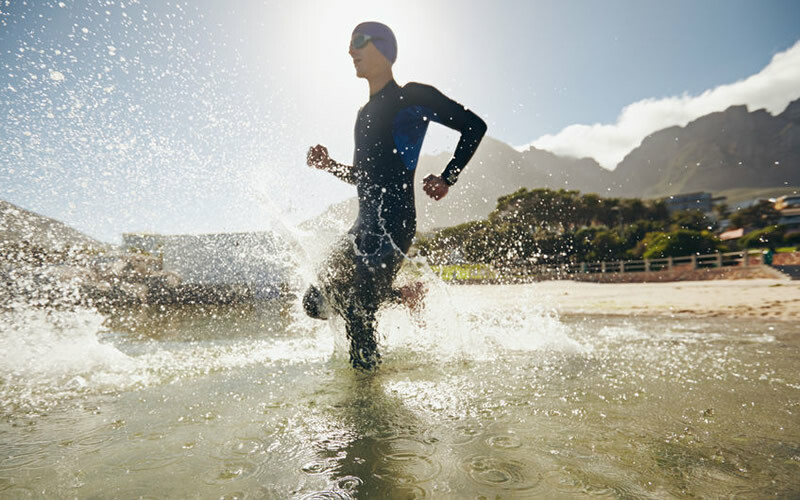 Focus on technique: become more efficient in the water, find your optimal cycling cadence, and improve your running gait. Now is the time to play with your footwear and find what works for you. Get your gait analysed and find ways to improve your efficiency. Lowering impact by using shorter but faster strides is a great way to speed up and prevent injuries. Probably the most important weapon in your off-season regime is resistance training. Your muscles have been battered all season, and in a mostly one dimensional fashion. Hitting the weights room will help to rebuild broken tissues, as well as bolstering strength and power for the coming triathlon season. Workouts should be tailored towards triathlon techniques. There’s little point in performing exercises that isolate unimportant muscle groups, when you could be spending your time doing compound movements aimed at strengthening and toning vital muscle groups and movements. Think lunges, deadlifts, pull-ups, core work and squats. For your own individual, professionally designed, off-season triathlon training plan, get in contact today. Here at Born To Train we have the knowledge and skills to help you continuously improve, push yourself beyond all conceivable limits, and reach for goals you may never have thought possible. Contact Us to arrange your own personal consultation.